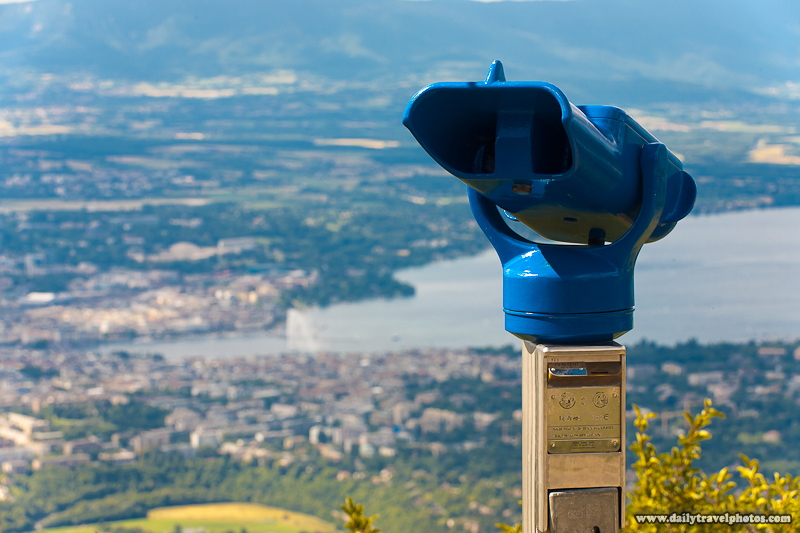 A coin-operated set of binoculars overlooks the city of Geneva from the Saleve viewpoint in France. I remember the good old days when I was a young whipper-snapper. These clunky cast-iron contraptions costed only $0.05 back then. Yeah, just a nickel! At today's exchange rates, you can slip in either $0.70 (€0.50) or $1.40 (€1). I'm afraid to guess how little time, upon payment, the binoculars remain open despite the increased charge nowadays. Oh, in case you make it to this region of Europe, head up to the Tibetan settlement on top of the Saleve. That's where you'll find this panoramic view of a large swath of Switzerland and strangely, a small Tibetan settlement offering Tibetan medical services.